These waffles didn't make a very big impression on me. The "red berries" - while prominently visually as specks in the waffle - have a surprisingly small impact on the flavor. I gave a friend a bite of one of my waffles and she said, "I didn't get any berries." On the second bite, she said she tasted the "red berries" and appreciated how subdued the berry flavor was. Personally, I felt hoodwinked on two levels. First, if you buy waffles called red berries, you expect a significant berry taste. You might as well buy regular toaster waffles. The second way I felt hoodwinked had to do with the packaging. There's an expectation these days that products from the Special K line have certain dietary benefits in line with their hight touted Special K Challenge diet plan. Next to the huge special "K" on the front of the box, there's a big claim of "80 Calories - Low Fat". You almost need a magnifying glass to see where is says "per waffle". On the side panel, you see that a serving consists of 2 waffles and 160 calories. Don't get me wrong. 160 calories is a very low and these waffles are a moderately decent health conscience breakfast option. It's just that with all the exaggerated claims on cereal boxes, I always felt I could trust Special K. I guess you really can't trust anyone, now. Other important nutritional information about this product: Each serving of TWO waffles contains less than one gram of dietary fiber - this is pitiful considering that even a cereal like Christmas Cap'n Crunch has at least one gram. One serving of these waffles also contains 5 grams of sugar, 0.5 grams of saturated fat, 0 grams trans fat, 4 grams of protein and a 25% to 30% smattering of various vitamins and minerals. 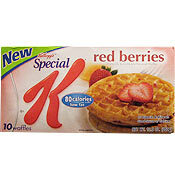 What do you think of Special K Red Berries Waffles? Just when they come out with something good, they discontinue making them. I miss the Special K Waffles also. Bring them back! I, personally, felt that considering how much lower these were in fat and sugar content in comparison to the regular waffles, they tasted pretty darn good to me! But... Too bad they are gone. If you go to Kelloggs' website, you will find they have been discontinued. So, people can stop searching for them. Bummer. My favorite frozen waffle is gone. Bring back Special K waffles! I loved these waffles and ate them plain. Why did they disappear? Where can I buy them now? Where can you find the 80 calorie special K waffles? I have looked everywhere. I miss these waffles. I have searched every where. Please bring them back. Why have they disappeared. What happened to them? I eat them everyday, plain, no syrup or butter! They are good solo! I have run out of resourses! I can no longer find them! I don't want blueberry or chocolate, plain plain is plain! 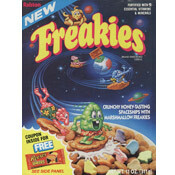 Please tell me where I can still get them! I wish I could find a special K recipe for the waffle to eat in the morning instead of the cereal! I like these but I wish they had more fiber. I'm a sucker for the packaging because Special K really does give me the illusion of eating better. This and low sugar syrup and I'm happy in my ignorant bliss.